The certification according to DIN EN ISO 3834-2 of SLV Hannover is also available. The permanent process enhancement by Quality Management is a matter of course. The Quality Management System of LASA according to DIN 9001: 2015 is certified by the DQS. 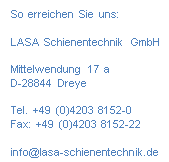 Additionally, LASA owns the certification "Sicher mit System" according to NLF/ILO_OSH 2001 of the industrial injuries corporation North-South. Outstanding Job Safety Management leads to successful and efficient work at construction sites.